Once you have started a conference or joined a conference as a moderator, you can use the Conferences interface to moderate and participate in the conference. Any user who starts a conference or an instructor who joins the conference will be given moderator permissions. Moderators can demote other moderators to viewers. The User Menu is open by default. To close the User Menu, click the Users icon . 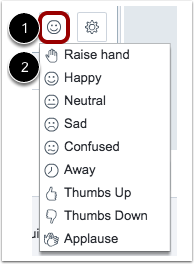 To manage settings for all users, click the User Settings icon . To clear users' status icons, click the Clear all status icons link . To mute users, click the Mute all users or Mute all users except presenter links . 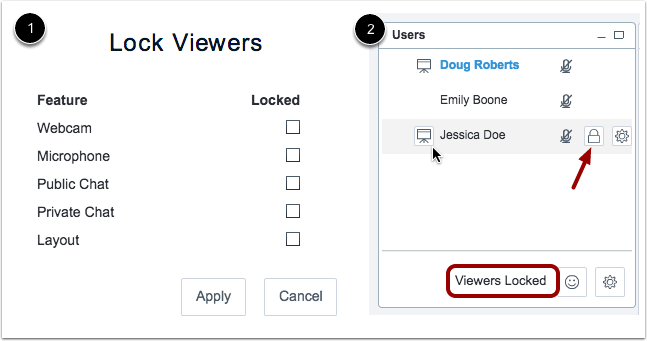 To lock specific conference features for users, click the Lock viewers link . To create breakout rooms, click the Create breakout rooms link . 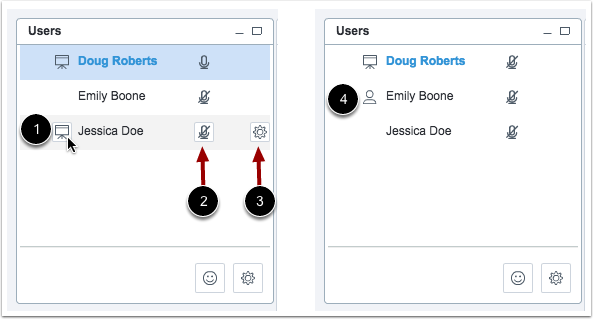 To chat with a user, remove a user from the conference, or promote a user to presenter or moderator, click the name of the user . The Presentation Window displays the presentation that has been selected by a moderator or presenter . To upload a new presentation file, start a poll, or share a YouTube video, click the Add button . 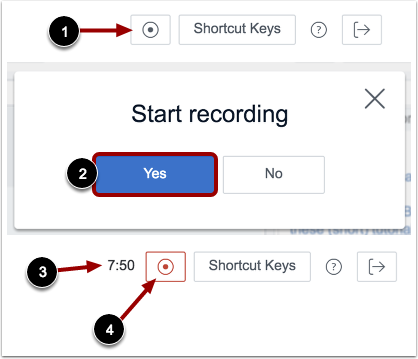 To begin recording the session, click the Start recording button . To enable your webcam, click the Webcam button . 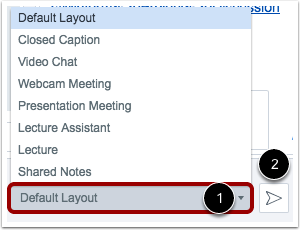 If webcams are enabled, you can close the presentation window and display only webcams by clicking the Close icon . To share your computer screen, click the Screen Share button . 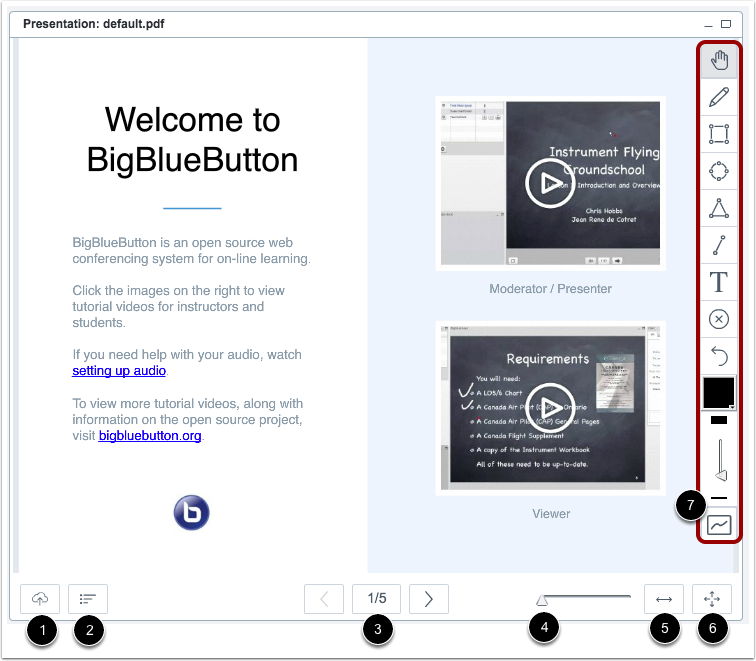 The Conferences interface includes several tools that you can use to annotate the presentation window. To use a pencil to draw in the presentation window, click the Pencil icon . 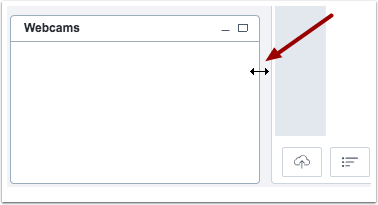 To allow all users to use the annotation tools, click the Multiuser Whiteboard icon . To end the conference, click the End meeting option . To logout of the interface, click the Logout option . To enable or disable chat alerts, click the Audio Alerts for Chat or Popup Alerts for Chat button . Previous Topic:How do I conclude a conference? Table of Contents > Conferences > How do I use the Conferences interface as a moderator or presenter?